Behavior of fluids is known to differ when they are confined in pores with typical diameters of a few nanometers. In nature this scenario plays out in a lot of examples. For example, water and hydrocarbon gases seep through the porous rocks in the earth crust to come to the surface. Room temperature behavior of fluids in such pores has been studied extensively in both natural as well as laboratory synthesized materials with nano-pores. This behavior is relatively less understood at low temperatures. Motion of molecules in a material is an indicator of the state of the material – molecules in liquid, solid or gaseous state move differently. Observing the motion of molecules in a material can thus reveal its state. Fig. 1. (a) Schematic of a neutron scattering experiment. Neutrons (n0) get scattered from a sample material to be studied (S) and are detected after being scattered in different directions by detectors (D). (b) A propane molecule; black and white sphere represent atoms of carbon and hydrogen respectively. (c) Model of a silica pore used in the computer experiments. Brown and red dots represent atoms of silicon and oxygen. A pore can be seen as empty space in the center. (d) Silica pore in (c) filled with propane molecules. (e) Propane molecules at low temperature in bulk solid state. 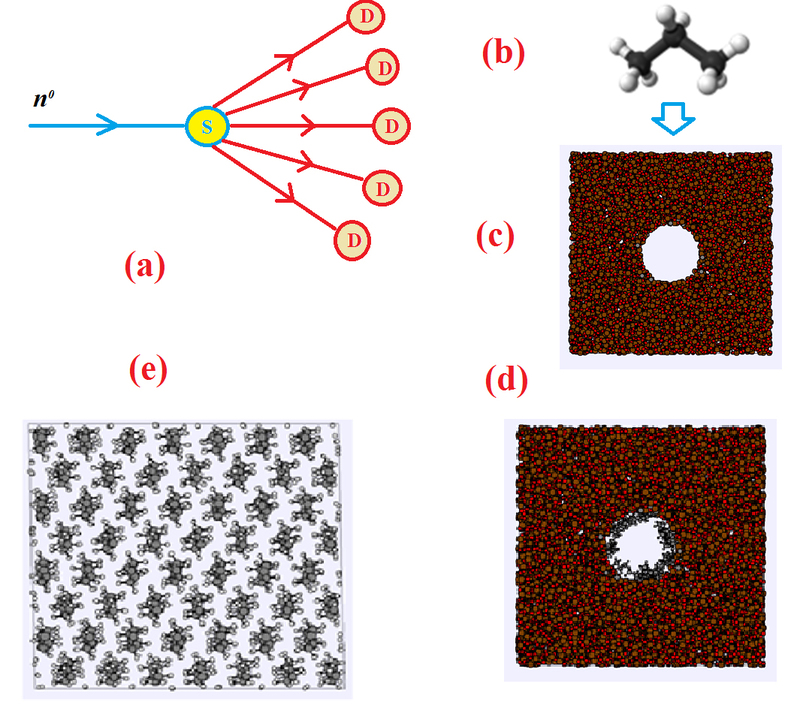 While propane molecules in the bulk solid state are arranged in a well ordered crystal as in (e), those in the silica pore are arranged in a disordered manner as in (d). This disordered arrangement gives rise to a glass-like solid state of propane in silica pores at low temperatures as seen in the neutron scattering experiment. One way of studying molecular motion is using neutron scattering experiments. In these experiments, a beam of neutrons with a known energy and momentum is bombarded on a material to be studied. The neutrons get scattered by the molecules in the material and are detected. The direction in which these neutrons are scattered and the difference in speed with which they travel before and after scattering, encode information, respectively, on the structural arrangements and motion of the molecules in the material being studied. In particular, neutrons are most easily scattered by hydrogen atoms and so neutron scattering is particularly suited to study the molecular motion in materials that bear hydrogen atoms. This happens for example, in the case of a hydrocarbon confined in pores of silica material. When a sample of porous silica with hydrocarbon fluid in the pores is kept in the path of a neutron beam, neutrons get scattered mostly by the hydrocarbon fluid inside the pores. In a recent experiment, we used this technique to study the behavior of propane – a hydrocarbon – confined in 1.5 nm wide pores of a silica material at low temperatures (up to 10 K). Normally, propane remains in a liquid state up to a temperature of 85 K, below which it solidifies, forming crystals. From the information obtained in the neutron scattering experiment on the molecular motion of confined propane, we could conclude that under confinement in silica pores, propane remains in liquid state at much lower temperature up to 80 K. Further reducing the temperature to 30 K or increasing the pressure up to 3 kbar, the confined propane solidifies. However, the solidified confined propane behaves more like a glassy rather than a crystalline solid. To understand the origin of this behavior, we conducted computer experiments using molecular dynamics simulations. In these experiments, molecular models of the material being studied are made and equations of motion for molecules in this model are solved numerically to obtain molecular trajectories. These molecular trajectories are akin to molecular movies in which behavior of molecules can be seen as time evolves. The results of these simulations indicated findings similar to those in the experiments. Further, the simulations suggested that the glass-like behavior of confined propane results from a disordered structural arrangement of propane molecules inside the silica pores. This is in contrast to normal solid propane at low temperatures in which molecules are arranged in a very well-ordered pattern forming a crystal. This combined study using neutron scattering and computer experiments thus sheds light on the low temperature behavior of confined propane and may help us understand the low temperature behavior of confined fluids in general. Effects of Confinement and Pressure on the Vibrational Behavior of Nano-Confined Propane.